Parsnip seeds notoriously take a long time to germinate – up to a month - and even longer when weather and soil conditions are not right. At the time when the seeds need to be sown (late Feb/early March), growing conditions are often starting to favour all sorts of weeds as well. ‘The Vegetable and Herb Expert’ recommends sowing 3 seeds every six inches and then thinning later to the strongest seedling. However, because of the length of time parsnip seed takes to germinate, they are often difficult to spot amongst the weeds and often get suffocated. This can be even more of a problem if you sow your seed later in March or even in April, when weeds are getting a good spurt on. At each station, six inches apart, I push into the prepared soil, half a cardboard tube from a loo roll, leaving half an inch above the soil level. 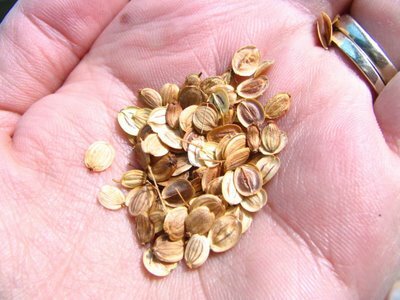 I then sow the seeds as recommended. You will know precisely where your seeds are when weeds are growing all around. To some extent they are protected from wind-blown seed and you can save water by just watering inside the cardboard tubes when the seedlings become established. The cardboard tubes can be removed once the plants are well established or left to break down in the soil. Another good parsnip tip is that the seeds don’t keep well from year to year – so don’t buy more than you need.